Learn American Pronunciation by Shadowing Movies on Netflix.com! Hello my dear friends foreign English speakers! I’ve spent a good few days enjoying myself during the Holiday Season – meeting friends, reading English fiction and also watching movies on Netflix.com. Speaking of watching movies, it’s a great way of developing your English pronunciation. And if you’re thinking you can just LISTEN and let all that content be absorbed by your brain… well, it just doesn’t happen like that in real life. You can’t just pick up accent by listening alone! 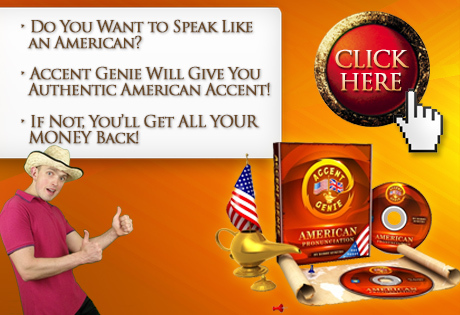 You need to SPEAK in order to accomplish your accent improving goals, and when you watch American movies, for example, to improve your American pronunciation, you need to SHADOW actors on screen so that your own American adjusts accordingly. To SHADOW, you have to SPEAK ALONG the person in the movie; basically you have to try and speak alongside! If you tried just to read the subtitles and speak at the same exact time as the actor, you wouldn’t pick up subtleties of the American speech! But for this exercise to qualify as shadowing, you need to speak RIGHT AFTER the actor. Anyway, if you tried to repeat the entire sentence after the person on the screen has said it, your speech would clash with the next bit they’re saying anyway, so it’s actually in your own best interests to make sure and repeat the speech alongside the actor. Netflix.com is the single largest movie and TV program database in the world, and nowadays it accounts for one third of the entire Internet traffic in the US, for example! Use subtitles and fire away at your accent improvement while enjoying yourself! And the best thing about Netflix.com is that it’s darn cheap – personally I’m paying 10 dollars a month to access the website, so I think that everyone can afford it! Does Shadowing Movies & TV Shows Not Rob the Enjoyment Out of My Experience? You can watch the film and truly enjoy it, and every now and then you can shadow some bits as you see fit. And even if you just do it for 5 – 10 mins in total, it’s an awful lot of practice considering otherwise you would have just watched the film which is 100% passive English immersion. So basically depending on which accent you want to improve upon – American or British – you just have to pick a film on Netflix.com and have a good time while also working on your English pronunciation. I am so glad to find your such a nice blog! I am a Japanese student and go to the international school in Istanbul. I have been here for about one and half years, but I still have problem with my fluent English. Yet after I found your blog online and did some exercise you recommend in your blog (such as speaking to yourself for 5 mins before going to bed), I definitely feel like I could speak English more fluently than before. I have a Japanese friends at school, so I am in kind of the situation that I can avoid to speak English and speak Japanese. And I noticed that it is not good for my fluent English issue at all. “You’ve gotta speak English all the time”. This words made me ashamed. Now I am trying to speak English all the time at home as well as at school. PS: Since I am staying in Turkey, I cannot use the website, Netflix.com, so unfortunate ;( If you have any other website to watch movies you recommend, please let me know! Thanks Sae for your positive feedback, and well done with your efforts to speak as much English as possible – it’s indeed the only way forward if you’re really serious about your fluency development! Speaking of other movie websites – try out this one and see if it works in Turkey: http://www.filmsubs.blogspot.ie/ It’s a Russian website for all I know, but it’s not full of spam or anything – you can simply watch the videos containing films with subtitles and the quality is quite decent as well! I count myself incredibly lucky to have stumbled upon your blog and your sharing. All this time I have been trying my best to adopt an authentic american accent, I am a Malaysian by the way. I realized, after watching your video and reading your comments, that I have been going at it all wrong. Like you said I watched a lot of American movies and repeated the lines after the actors/actresses, and to my disappointment the results are never satisfying. Now I think I understand why. I have quite a few questions I would like to ask you, I do hope you are okay with it. How long would you recommend me to practice shadowing per day? Is it true that the more I practice per day the greater the improvement will be? How long do I have to give to be able to notice a significant improvement in my accent? Oh and another thing I noticed about your speech pattern when you speak is that you, like many American friends I have made in my brief stay in the States last year, pause a couple of times in your speech, but oddly the pauses sound very natural to me and do nothing to break your speech flow. I can be fluent with English if I want to but occasionally I will pause too, and I have been told a lot that my pauses are weird and as a result add some kinda foreign touch to my accents. Will shadowing help me get rid of this problem, that is to say, will I be able to sound natural even if I pause for thoughts? I know I asked a lot, and I apologized for that, but I will REALLY appreciate your feedback. Have a good day and wish you the best of luck in all you do. Hi Andy, and thanks a lot for getting in touch! There’s a very simple connection between shadowing and your accent improvement – the more you do it, the faster your pronunciation will improve – it’s as simple as that! On top of that, however, I definitely suggest to do loads of self-practice where you just speak on your own by trying to put on the American accent – shadowing alone won’t cut it. Congratulations for your wonderful website. I’m from Brazil and I’ve been studying English for a couple of years, listening is a great challenge for me, though. I wish you could answer this question of mine: Is that possible to understand 100% of a movie, serie or news? Or, as a speaker of English as second language, I have to accept that it is not possible to achieve? I don’t know if it matters, but I’m 28 years old. Hi Francisco and thanks a lot for your positive feedback on my blog! Speaking of learning to understand 100% of a movie or TV program – it’s not even possible in one’s native language! There’s always something that will wash over your ears, but just because we’re foreign English speakers we tend to put it all down to the fact that we’re foreigners so our English mustn’t be up to scratch. In reality, even native English speakers don’t get 100% all the time, so the approach I advocate for is – don’t AIM for perfection and 100% understanding because that way you’re setting yourself up for failure! Just do as good as you can and be 100% content with your CURRENT level of understanding while at the same time working on it all the time thus bringing on the day when you actually understand 99.9999% much sooner than if you were to be unhappy with your level of understanding. What’s the best way to practice shadowing – listen first and speaking later, after listening to the previous episode (in case of TV series) or listening and speaking from scratch, without a previous knowledge of the story? There’s really no need to watch the episode first and then shadow it – you can do it as you go along! Next post: You’re the Best Judge of Your Own English Pronunciation! Previous post: Happy New Year Everybody!! !